I’m conflicted about Rocket Bunny equipped cars. Part of me says it’s too much, and the other half of me wants to jump in the nearest kitted Nissan S13 or Toyota 86 and thrash the crap out of it whilst hollering out of the window with joy. There’s just something so very ‘f*#k you’ about cutting up the kind of car that so many people aspire too, then adding a design that polarizes opinion all over the world. But until you’re reaching into your wallet, your opinion is just that. 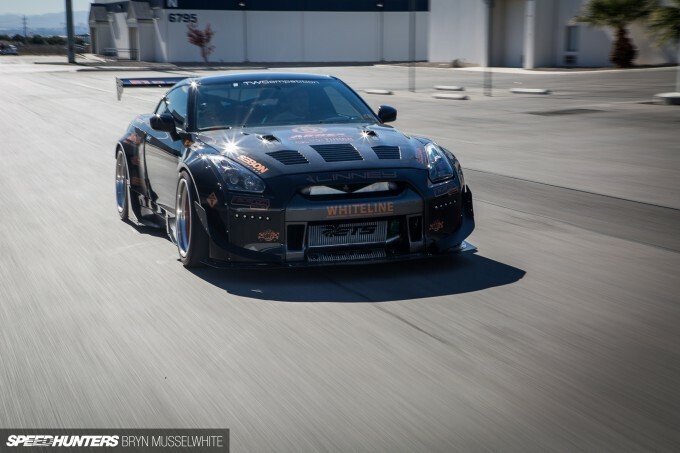 Chris Dunbar, who owns this R35, has put together what could possibly be my favourite Rocket Bunny car yet. I’m not even joking for the sake of a good article either – the GT-R Rocket Bunny kit is one of my favourites, along with the RX-7 a close second. I really enjoy the lines and the way they compliment what’s already there whilst adding a crazy GT-style influence. 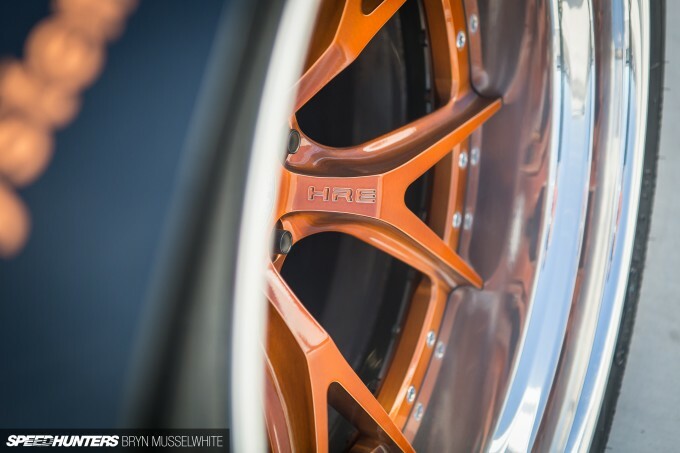 The HRE S101 wheels used here have got a proper global feeling to them too. By that I mean they hint at Europe in the origins of their design yet still feel Japanese, and the finish and manufacturer are quite obviously American. Inside Chris didn’t go crazy, because the R35 is already a really nice place to be straight out of the box. 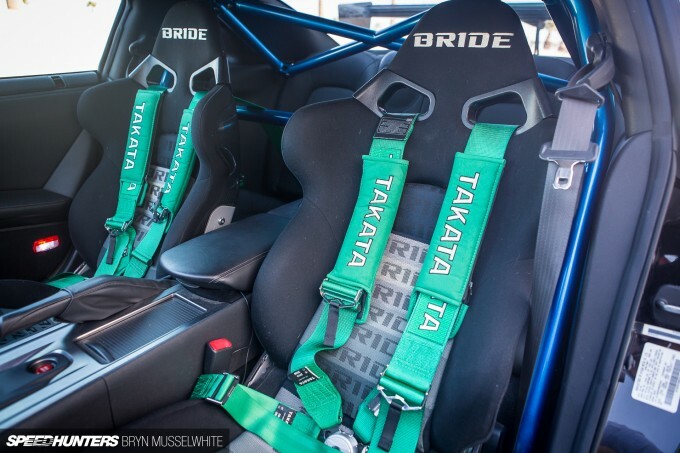 The Bride Vorga seats are a stylish nod to the car’s Japanese heritage, and of course you know we love Takata belts. 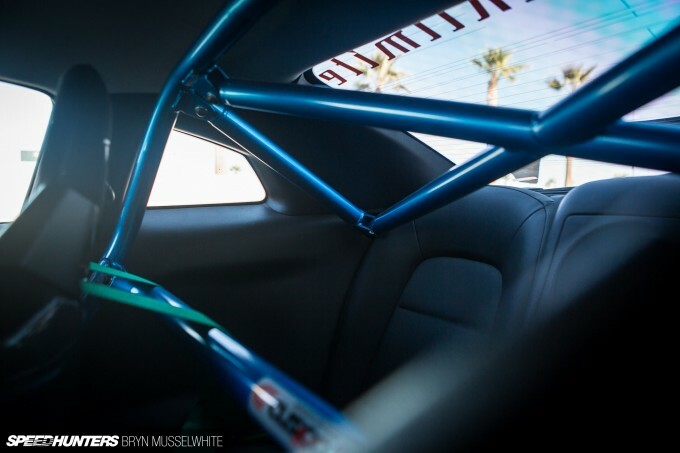 A Cusco chromoly cage braces up the back, but means that the GT-R is now strictly a two-seat affair. The graphics might be a bit strong for my tastes, but we shot these pictures fresh off the SEMA show floor. I’ve seen plenty of images showing the R35 running in plain, mile-deep paint – which is a look I really like – but why not be a bit sinister? That’s the thing with Rocket Bunny cars, they make you push a bit further than you normally would. You literally have to walk on the wild side and then you get to understand them. Power? Somewhere between 600 to 700hp thanks to some choice modifications from HKS, AEM and plenty of others, plus expert mapping from Ben Linney. That’s a name I know from way back in the UK tuning scene, where he’s still very much a fixture. Despite what your mate who thinks everything needs 1000hp-plus will probably try and tell you, there’s more than enough power here to have some proper fun with. It looks damn good, huh? It’s okay to admit that… So many people have a knee-jerk reaction of dislike for these kits, but when was the last time you actually saw one in person? Think about it – they’re hardly common. You may have noticed the ride height here is slightly higher than my first shot, and that’s thanks to an AirREX air/coilover suspension install. For practicality’s sake, it’s a move I’d make in a heartbeat. Wow now this in one nice R35! Too much exterior for 600 hp. I appreciate the need for that harness bar behind the front seats but the half-cage and rear seats thing looks kinda like... wasteful of weight. I like the exterior and the sensible engine mods, and the front seats/harnesses. The jury is out on air-ride here though. "Only The Brave Need Apply"
How about insane people? Like me? Nah, I'm just messing with ya. This build is regularly cool. Boss, in particular. Gives me that meaty vibe. 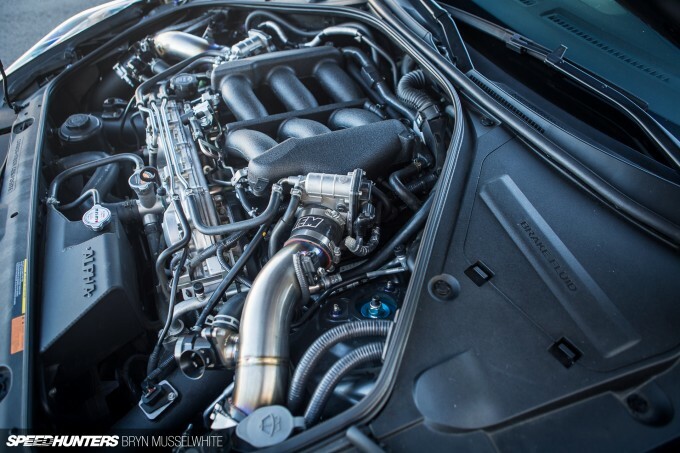 @Frozenstar I disagree, like the article says 600-700hp is plenty...... when did 700hp become the norm? The car with too much exterior, and lack of power that you're thinking of, is the RB VW New Beetle...... Waste of a RB kit if you ask me. Nice looking build, would certainly turn some heads! Nice photos too. Would like to see less stickers, aftermarket side mirrors and maybe the rears poking out another 10-15mm. I just really can't see how an air ride setup is useful on a GTR. Didn't nissan meticulously engineer every square millimeter of these things to perform a certain way? 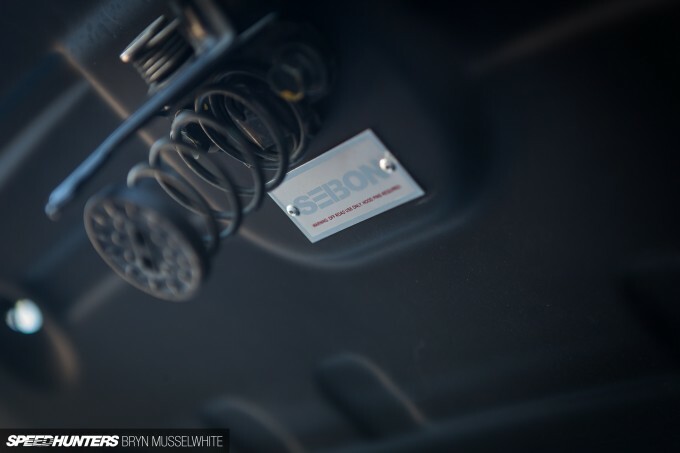 It's clear to me that air suspension is an obvious improvement on some economy vehicles, and maybe a big luxury sled, but purpose built sports cars??? I'm terribly sorry, you guys teach me to be accepting, but I just don't get it. And that's me being objective. I do like the car. I'm waiting patiently to see a RB kitted anything where I live in RI. I'm glad it's not pushing 4000hp because I believe in being well rounded, not throwing in all your chips on one aspect of a car. 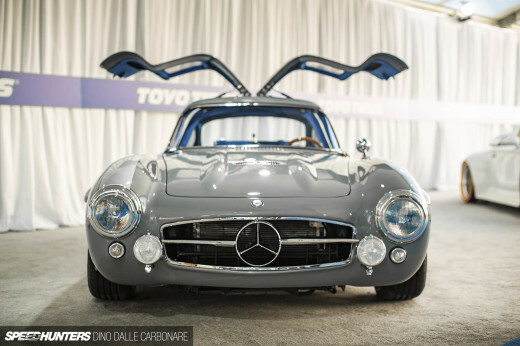 That's what makes japanese cars cool to me. johnbezt It's not necessarily that air ride is an improvement in outright handling performance, but with companies like AirRex and AirLift, you can have performance that is easily on par with the stock suspension, with the benefit of height adjustability, not to mention rebound/compression adjustability. only thing wrong are the back seats, that cages stops people sitting there so you may as well remove the seats and put a nice speaker system or leave it with carpet. 9:28 amJuly 2, 2015 Nick. Rocket bunny was cool and exciting the first 50 times. There is other after-market "body kits" out there. iProGam3r You might as well remove those bars anyways, they're not legal for racing, joints must be welded, not bolted. This is just a show circuit queen, with bags, it's all for looks. Sure it's still plenty capable, but it's just a tuner with a bunch of faux racing gear. Getting pretty board of these build, RB, yawn! KootenayDub iProGam3r If people like Crapco so much, why not buy an Autopower or Safety Devices cage and spray paint it sky-blue? 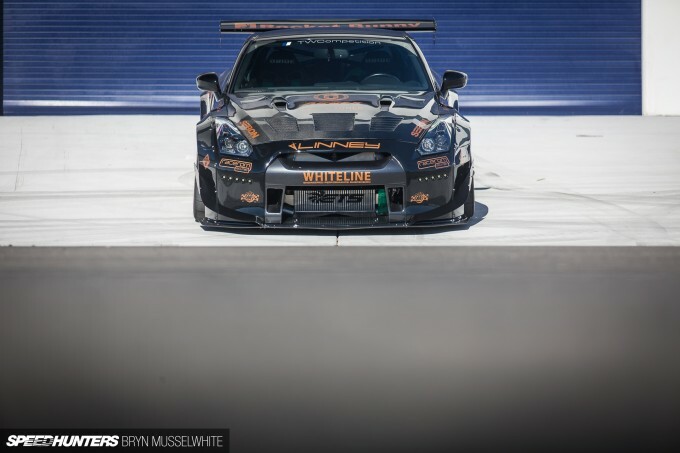 for tuned r35 datsuns, 650-700 hp is pretty much the norm! huge bodykit, huge wing, etc, for a streetcar.. Not necessary. People are acting like they're smarter than a whole bunch of japanese engineers. Thats why they install air suspensions and whatnot. I believe the saying is " I NEED MONEY!" Though that splitter would have to be made of the same stuff ironman's suit is made from to survive the roads around here! @Frozenstar Look it up. It looks really really good. And a VW beetle will never be all about performance so hes missing the point. The back seat is practically useless in 2 door Nissans (I own a S15, it's so tight in the back a 6 year old amputee couldn't fit!) So a cage is probably not a bad idea. Though I agree it should be welded. KootenayDub Rocket Bunny didn't build the car, it is just fitted with one of their kits. It's a shame so many tuners get RB kits to make their cars stand out but never go full race car with their builds. My issue with Rocket Bunny is it seems like an awful permanent modification for a trend. In a couple of years all these cut up cars are going to look extremely dated. That being said I love the FD RX-7 kit! Covering your cars in stickers is way worse than a rocket bunny kit. How about another bensopra r35? AnthonyJohnson3 A very valid criticism! I'm not a fan of overfenders myself, so I like the RB approach of removing what would otherwise be covered up, but - unless someone comes up with a new kit for a few years down the line that lets you reuse the holes made in fitting the RB kit, there's going to be a lot of cars that are permanently... dated. It's not always a bad thing, see Koenig Ferraris and the Veilside RX7, but it does limit future options. However, Chris's ride is a true sight to behold. This RB GT-R is straight fire, and commands the full attention of any room/parking lot it sits in. Sitting by itself in a tucked corner of the SEMA show last year, it always had a crowd around it admiring all the great details and work that has been put forth with this build. 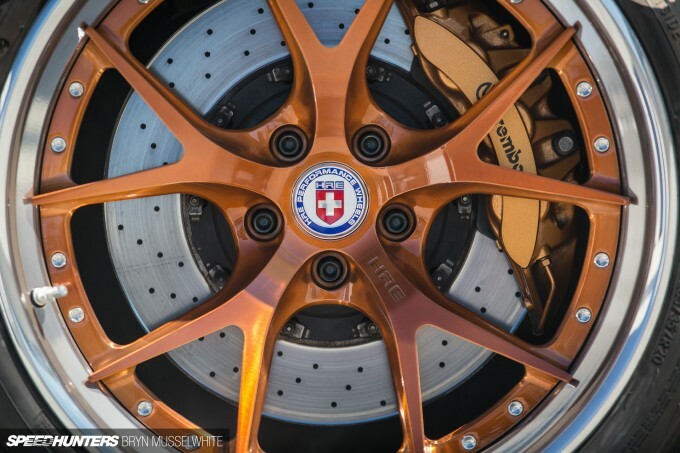 The HRE wheels and black/ burnt orange color scheme is strikingly unique and refreshing. Proud to be a part of this build!! Way to go Chris!! PirateWill AnthonyJohnson3 You see I don't think they'll become dated. Look at how long the S13 kit has been around, yet it still looks good. Sure there will be those that have bought RB because it's fashionable. But I'll bet a lot have converted cars because they love them, timeline aside. Nick. I guess you must live somewhere that's flooded with them? Because I know I don't! prazzi High five to that! @Frozenstar Every factory standard vehicle is designed and produced by a whole stack of people as well as engineers, some of whom count the pennies. It has to appeal to as wider audience as possible. Now I don't know of any manufacturer that fits air suspension as standard that will drop your car to the ground, yet it's something I love, so does that mean I can't have it? Hell no! Such is the beauty of the world we live in, I can! What's more with the advances in technology I can have a great ride and good handling too. Jagdroach If there's some sort of local hand signal, I'm throwing it out of respect! 11:12 amJuly 3, 2015 Nick. lol, what I don't get tired of is your photography. 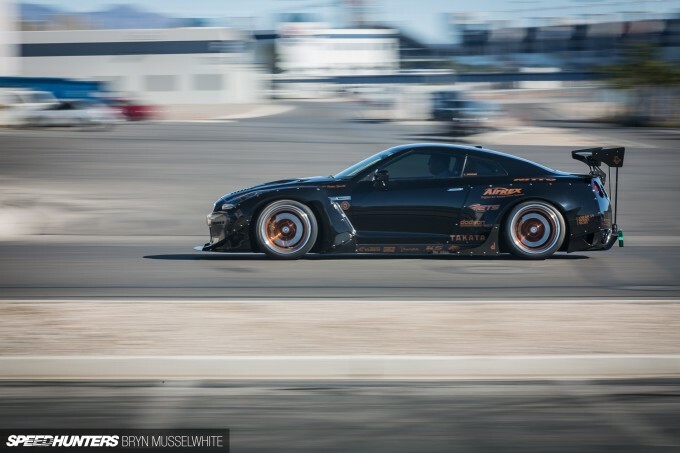 Rocket bunny is another story. Speedhunters_Bryn Smiggins Ya but plenty of people cover their cars in them just because they like them. What ever floats your boat but to me its way worse than a rocketbunny kit. Also you have plenty of cars at SEMA that arnt covered in stickers. 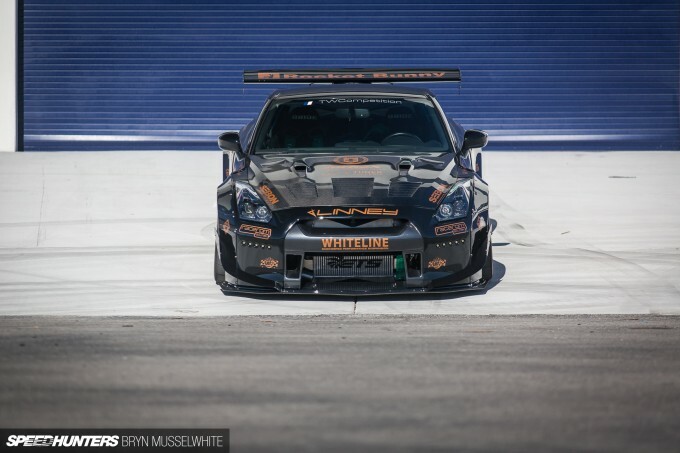 Speedhunters_Bryn Nick. Lol, so true. I bet people that complain about them have never even seen one in real life, only on the interwebz. Smiggins Agreed, I come from another planet where those companies have to pay you if they want you to put their name on your car. This is perfection. Any info on detailed specs?